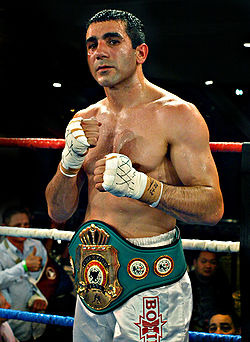 An aging boxer who works as a Melbourne wharfie is offered a shot at a world title against an unbeaten American - sounds like a movie script but that's the life of Frank LoPorto (photo). The 33-year-old has been offered the fight of his life against World Boxing Association super welterweight champion Austin Trout (23-0, 13 KOs), on November 11 in El Paso, Texas. LoPorto, the current PABA champion (15-4, 2 draws, 7 KOs) has been described as being no more than a spirited work-out for Trout, who is already eyeing a fight with interim WBA world title holder Anthony Mundine. But LoPorto's camp believe `No Doubt' Trout is in for a surprise. "I'm going to be a bit of a mystery to them," LoPorto said from his Port Melbourne training base. "I'm going to try to give him hell from the first round until the last." His trainer, Mick Hargraves, said there was no video footage of LoPorto for Trout to study. "The thing about Austin Trout is, he only fights boxers, he picks opponents to suit him," Hargraves said. "But he never fought anyone like Frank, once he's on your chest he won't leave you alone, from the start to the end. LoPorto only got the phone call of his career two weeks ago, when Trout's scheduled opponent Yuki Nonaka broke his hand while sparring. Trout had to fight a world top 15-ranked boxer before the end of the year so went for No.14 LoPorto, who doesn't mind his story being compared to a Rocky movie. Adding to the emotion of it, Hargraves' brother Kevin, who was also a trainer and very close to LoPorto, died of cancer the same morning the fight was offered. "It's meant to be," said LoPorto, who names Roberto Duran and Mike Tyson as his two favourite fighters. Taking leave without pay to prepare and having never travelled further than New Caledonia, LoPorto admits the odds are against him toppling Trout. "He's very skilful and knows his way around the ring but he hasn't fought someone like me," he said. "I'm fighting a world champion, it's a step up for me but I've been in the game for a long time, I can match it."